Date nights are so important to all relationships. I’ve been married 14 years and life has HAPPENED. Right now the majority of our time is spent taking care of our three kids, working our jobs, and maintaining our home (with our slightly to big yard!). It’s been so easy to get consumed with all of these “to dos” and leave less time for my spouse. We have learned that we MUST make date night a priority, or else it probably won’t happen. I get it! Dating can be expensive! Just dinner and a movie could easily cost you a quick $50. PLUS, when you have to hire a babysitter….those dates can add up fast. I have BEEN there! One thing my husband and I have learned to do is to have date night at home. This saves us the added cost of hiring a babysitter and is almost ALWAYS cheaper than the dates we have outside of the home. We plan a night each week, put the kids to bed, turn off the TV, put away all phones and other distractions and we spend time TOGETHER. It has done wonders for our relationship! 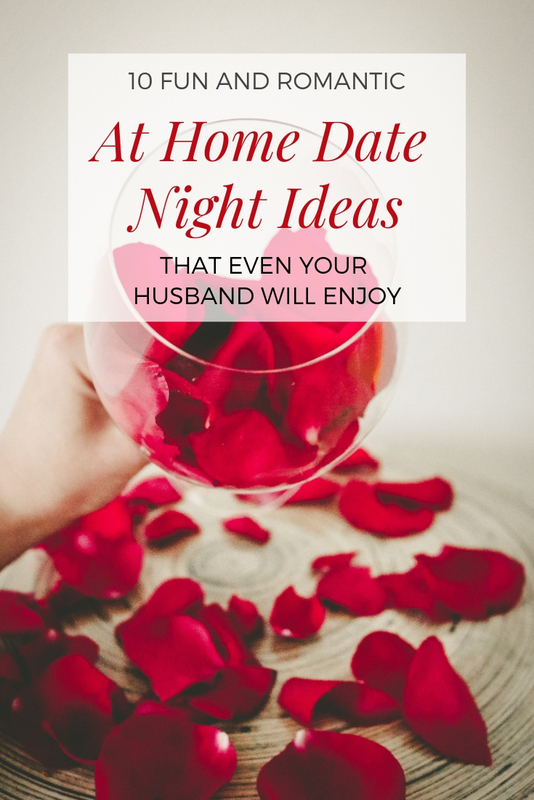 I’ve made a list of a few of our favorite at home date night ideas. Hopefully this will help you brainstorm a few that you and your significant other can enjoy. For EVEN more FREE date night ideas check out my post, 20 FREE Valentine Date Ideas. There’s no rule that says you have to go out to a fancy restaurant in order to enjoy a romantic dinner. Cook a special dinner, put the kids to bed and enjoy a quiet dinner for two. Set the mood by lighting some candles, dimming the lights, and adding a pretty tablecloth. Ask each other “would you rather” questions to get to know each other a little better. It’s such a fun way to learn more about each other. You can ask serious questions, or be a little more lighthearted and fun. I’m still surprised at all the random idiosyncrasies I keep learning about my husband! Try some new foods together with a food tasting. Look for new food at the grocery store that you normally wouldn’t buy. Perhaps, some fancy cheeses and unique fruits. You might even find a few new favorites! I’m a bit of a nerd in the fact that I seriously love personality quizzes. I’m betting there isn’t a personality quiz out there that I haven’t taken. For a fun date night you could both take a personality quiz and then read each others results. It’s such much easier to understand why someone is the way they are if you understand their personality better. Dream up your future together! Set goals and put together a dream board of what the two of you hope to accomplish within the next 5, 10, 20 years. The best way to achieve a dream, is to have a dream! If it’s warm outside, set up a little outdoor picnic. Lay out a blanket to sit on, pack all your favorite finger foods, and enjoy time together in your own backyard. Try to schedule it right before the sunset so you can enjoy dinner and a show. Be sure to bring an extra blanket for snuggling. Who says ice cream is just for kids???? My husband and I have a serious deep love for ice cream. It’s fairly common for one of us to buy a pint of ice cream as a sweet gesture to the other. How about making gourmet ice cream sundaes, WITHOUT the kids around? Pile it high with all your favorite toppings, finish it off with a cherry on top (of course! ), and enjoy talking and spending time together while you eat your ice cream sundae! Test each others music knowledge with a friendly game of name that tune. Travel back in time and play some of the hits from when you were kids. Turn it into a friendly competition with a small wager (maybe loser has to make the bed the next morning????). Watch some youtube videos about a new skill you have both been wanting to learn. These could be a few weeks worth of dates, as you continue to learn and improve your new skill. Perhaps you will want to learn about photography, cooking, art, or a foreign language? The options are endless! Maybe you could each pick a new skill you would personally like to learn and you can take turns supporting and learning the others chosen skill together. Date night has truly become a night I look forward to ALL week! Sometimes us moms just need a little adult interaction, amiright?!?!?! What are some of your favorite at home date night ideas??? Let me know in the comments! The more ideas we share, the better for all of us!! Love board game nights and definitely going to give the ice cream sundaes a go, thanks!